There are countless books on leadership and change management. Most of them have in common that they propose a specific way how to achieve performance and accomplish change. Alas, our world around us, business and we, ourselves, have changed. The traditional linear mechanical model of leadership has become outdated. In order to understand the leadership we need today and tomorrow, begin by grasping the now, the present, accept it and let go and thus create the necessary space for things to unfold. Tomorrow’s leadership is not so much steering as creating, unfolding and shaping the space for potential development of individuals, teams, organizations and businesses. In his new book “The Next Wave in Business” Stefan Götz outlines the pitfalls and blind alleys of old mechanical leadership philosophies. He takes his readers on a journey to a holistic, fresh leadership culture. The book begins with a snapshot of the many ills in our economy and environment which stifle innovation and long term development opportunities. Stefan Götz guides the reader on the way to business 7.0 which focuses on unfolding our true potentials. The book is enlightening as well as sobering because of its honest and unsparing description of traditional business. The book’s clear structure and orientation towards holistic management and business 7.0 makes it inspiring and motivating. It is a must-read for everyone who doesn’t understand leadership as a blind, Machiavellian posturing, but want to make and leave a positive impression in society and in the economy. Stefan Götz’ book is available as an eBook in English and a print-edition in German. In order to reach a wider audience Stefan Götz wants to publish a print-edition in English, too. For this purpose he wants to start a crowd funding campaign raising money to launch the print-edition. The money will be used for typesetting, editing, cover design, PR work and marketing. For the crowd funding campaign to start he needs at least 100 fans. 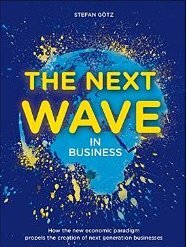 Please visit https://www.startnext.com/en/the-next-wave-in-business-book for details and support this unique project. The big question project leaders need to ask is what they really want to achieve; on behalf of the project and on behalf of the team. This is not just about project deliverables, but about project success as a process. It is about considering the overall picture with all its constituent parts. Project leaders understand the purpose/motivation, vision and objectives of the project. And they know that the heart and soul of every project is the team. They ensure that the team has a common understanding of the MVP – Motivation, Vision and Project Objectives – as it gives the team a strong common denominator. Motivation addresses the purpose of the project. Vision describes the ideal state after the identified problem has been resolved. It gives the project a direction. Project Objectives clarify and qualify the vision and describe the stepping stones toward that vision. In my own experience, most project teams may know the project objectives. But they often lack the understanding of the overall meaning of them, how they were developed and, more importantly, why. But, it should not stop there. As a project leader, what you should do next is ask your individual team members about their personal MVPs. That is, what motivates them to be on the project? What do they envision for themselves personally and what are their personal objectives and aspirations? Give your individual team members time for reflection, and then ask each person to share their MVPs. This requires openness and trust; two ingredients of great leadership. As a leader reach out to your team and create an environment where it feels right to share this. If you find it difficult to answer the MVP questions, ask: what makes you happy and why? How do you want to feel on this project? How do you want to be treated? And how do you want to treat others in their pursuit of personal happiness on the project? “[After all,] the only way to do great work is to love what you do, and to do what you love” (Scharmer, C. O., & Kaufer, K. (2013). Leading from the Emerging Future: From Ego-System to Eco-System Economies (p. 287). San Francisco: Berret-Koehler Publishers). The personal MVPs complement the MVP of the project. And yet, it shouldn’t stop there. The third dimension is the MVP of your team and community. Hence, ask your team what your MVP as a team should be. How does it fit in with the MVP of the project and how do you accommodate the individual MVPs within it? I have found these MVP exercises the most valuable investment in a project. Leaders understand these three dimensions. They know that successful projects are not just about projects, but about people and a group of people forming a team or even a community. The overlap of these three levels of MVPs can spark a WOW project where there is common understanding of the motivation and direction of the project as well as the drivers, visions and objectives of each individual and the team as a whole. This is a very, very strong foundation for project success. Today I want to share some of Q&As from Neal Whitten’s book Neal Whitten’s Let’s Talk: More No-Nonsense Advice for Project Success—Over 700 Q&As! which I highly recommend to anyone seriously interested in project management and leadership. Q. As a leader, is an ego a help or a hindrance? A. Mostly a hindrance. When you go to work each day, leave your ego outside. It’s not about you. It’s about the success of your project, organization, and company. It’s about good business. An overactive ego can get in the way of making sound judgments, establishing and maintaining good working relationships, and learning and growing from our mistakes. Q. As a young person, I am not seen as a leader to be treated with respect, even though my teams and projects have received high marks for success. How can I deal with this “handicap”? A. Savor your youth. Do not wish it away; it will evaporate sooner than you would like. All of us were young employees once. You must channel your energies and passion into performing your best. But a word of caution: Show respect for the knowledge and wisdom of those older than you. Be open to their ideas, and do not come across like a know-it-all. As much as you think you know now, you will know far, far more in five, ten, or twenty years. For now, you may have to work harder than others, but you will win over some converts. Q. I don’t look forward to the plethora of problems that confront me each day. As a leader, am I in the wrong job? A. Perhaps, but if you expect to remain a leader in whatever job you choose, you must learn to like and be comfortable around problems. You should adopt the attitude that “problems are our friends”—without problems, you probably would not have a job. Moreover, your level of salary is likely related to your ability to solve problems. As a consultant and mentor, if I did not have problems to confront, I would not have a job. I sincerely and enthusiastically look forward to the problems that my clients throw at me. If too many are coming my way, then I will prioritize them, and the most important and urgent problems will be solved first. The higher you climb career-wise and the more responsibilities you take on, the greater the likelihood that you will be unable to resolve every problem. You will either need to get help from others or accept that some problems take longer to resolve than you’d like. Whatever challenges you must confront, thinking about problems with the right mindset can make all the difference in your effectiveness and enthusiasm. Projects become more prevalent. Not surprisingly the art of project management becomes more popular. Unfortunately this does not imply that the more projects there are the more successful they are. As a matter of fact a significant percentage of projects fail or do not yield the desired results. While in recent years the number of successful projects are on the rise, it is scary how slow this process has been. 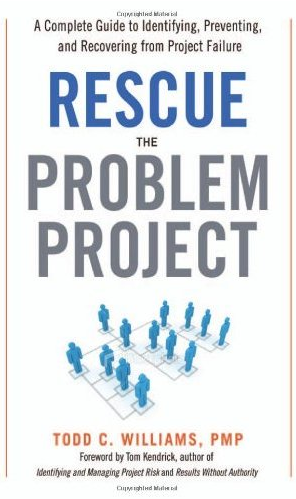 Todd Williams’ book “Rescue the Problem Project: A Complete Guide to Identifying, Preventing, and Recovering from Project Failure” (2011) is a welcome and much needed aid to help rescue and re-align struggling and failing projects. It is a very valuable resource for anyone working in a project management. Regardless whether or not the own project is on its way to glory or doom. Williams embraces a holistic approach to project management. He explains the need and value of existing project management tools that help rescue the project management. And he goes beyond the mere listing of tools. In the Introduction of the book he stresses four key factors that are critical in rescuing a problematic project: (1) The answers to a problem in or with a project are in the team. (2) A strong team can surmount most problems. (3) Stay involved with the team. (4) Objective data is your friend, providing the key way out of any situation. By emphasizing the value of the team Williams goes beyond a mechanical “Abhandlung” of a recipe book for project rescues. He explains in simple, plain and thus easy to understand language why most answers to problems in and with a project are rooted in the team. A project is not made up of resources but human beings interacting in a social environment, building communities and network. As complex and complicated this network is, it contains an endless number of potential traps and opportunities at the same time. The first step is to realize that a problem exists. As simple as this sounds this may actually be the most difficult step of all. The key is that the awareness of a problem is not limited to the operational level of a project but that management has to acknowledge this fact and expresses an interest in resolving the issue, helping the team to become successful. The second step to project recovery is an audit of the project. The term “audit” has a negative connotation to many project practitioners. This must not be the case if all audits would follow the guidelines Williams describes in his book. He starts analyzing the human role in a project, followed by reviewing the scope on a red project, determining timeline constraints and examining technology’s effect on the project. The insights gained from the audit analyzed in the third step. They are the ingredients for planning the actual project recovery. To me this part of the book is the most valuable one. Not because the author develops a clean and clear outline effective approaches to analyzing audit data but because he explains how they fit in with the core statement of the book, that a strong team is one of the critical success factors for project recovery. Doing so he stresses that project recovery is not a mechanical task, following a checklist and applying sane project management techniques. Instead he explains that it takes leadership and oversight, a deep understanding of the heart and soul of a project. Acknowledging the fact that more and more projects do not follow the traditional, sequential waterfall approach, Todd Williams gives an overview of other project management frameworks and methodologies, namely Agile and Critical Chain. He then compares them with respect change management needs, customer relationship, estimations, project constraints, subcontractor relations, and team structure. The fourth step to project recovery is to propose workable resolutions. This is when the recovery manager presents the insights from the audit analysis and concluding mitigations and negotiates the next concrete steps with the project sponsor and stakeholders. Williams stresses the importance of staying focused on project recovery and not getting sidetracked by distractions such as maintenance and other conflicting projects. Last but not least, the fifth step involves the actual execution of the recovery plan. As hard, tedious, frustrating and rewarding project recoveries can be one of the key questions is what project managers can learn from past mistakes and successful recoveries. This is covered in the final part of the book entitled “Doing it Right the First Time: Avoiding Problems that Lead to Red Projects”. It shows that project failure often starts at the very beginning of the project. It can be prevented by properly defining a project’s initiations, assembling the right team, properly dealing with risk and implementing effective change management. While the book may be most interesting to those who are facing or have faced problem projects I hope that novice project managers read this book, too. It will help them avoid common mistakes and set up a good and solid structure for project success. And in case troubles arise this book will help them guide projects to safer havens. I have written many posts on the right leadership principles for project success. I strongly believe that effective project management needs to have a solid foundation in leadership. Without leadership chances are that projects become “just another project” – far from the sought after “Wow”-project. I encourage you to read the complete blog post by Claudia to learn more about these skills. Only so much: These 5 skills go hand in hand with the 5 leadership principles (1. build vision, 2. nurture collaboration, 3. promote performance, 4. cultivate learning, 5. ensure results) I elaborate in my own book. They compliment each other. Note though that knowing about these principles and required skills doesn’t make you a leader yet. You have to practice them, live by them. And, keep in mind, that these principles and skills make success more likely. Alas, they are no guarantee. It is up to you to make the most out of it. I am happy to post 2 new reviews of my book “Leadership Principles for Project Success“. If you are interested in reviewing the book and write an official book review, please let me know. It is true that Wal-Mart is an excellent example of “traditional management” as we have seen in so many firms for a very long time. It is also true that Wal-Mart has to change something unless it was go down the drain sooner or later. However, I am not convinced that a change in management may be sufficient. Radical management as Steve describes it in his book is the right ingredient. Alas, I don’t think they are sufficient. What it takes to change the game in cases like Wal-Mart is LEADERSHIP. This leadership ought to be based on the principles of radical management. Leadership has to ignite the fire for change and innovation; radical management can sustain it. 1. The goal of work is to delight clients. 2. Work is conducted in self-organizing teams. 3. Teams operate in client-driven iterations. 4. Each iteration delivers value to clients. 5. Managers foster radical transparency. 6. Managers nurture continuous self-improvement. 7. Managers communicating interactively through stories, questions and conversations. Leadership starts with assessing and understanding the situation; this includes understanding its customers and finding out what delights them. This is a first step. Then leadership has to help build a vision for change. Without this vision, the “project” is likely to fail. It will be very interesting to see whether or not Wal-Mart will be capable of making this change. Personally, I have some doubts. In Germany Wal-Mart miserably failed in its market entry. Not because it sold the wrong products. Not because the products were not always cheaper. But because Wal-Mart did not bother trying to understand the culture of German customers. This is negligence, yes. But even more so it shows that Wal-Mart has the wrong attitude; it lacks the willingness to look left or right. Call it arrogance, ignorance or whatever you like. It is the recipe for long-term failure. Wal-Mart has a lot of money and a lot of assets. These will secure that Wal-Mart will be around for quite some time to come. However, as long as it limits its focus on managing them, its business will deteriorate. Radical management as proposed by Steve Denning is a necessary condition for change but it is not sufficient. What it takes is LEADERSHIP based on radical management. To learn more about this kind of leadership for success, read my book “Leadership Principles for Project Success” (CRC Press, 2011). This book is about project success and the secret to achieving this success, effective project leadership. Filled with samples, templates, and guidelines, it covers the five principles of effective project leadership: building vision, nurturing collaboration, promoting performance, cultivating learning, and ensuring results. Using non-technical language, this practical guide explains how to integrate these principles into daily work to help you effectively set up, manage, and align your projects for success. Some special features of the book: Explains the principles encompassing the core of effective leadership and shows how to apply them to everyday projects; Discusses setting up, managing, and aligning projects to meet business needs; Illustrates how project leadership works through numerous real-world case studies; Describes how to rescue projects in trouble and close them successfully; and includes many samples, templates, and practical guidelines that readers can immediately use in their projects. 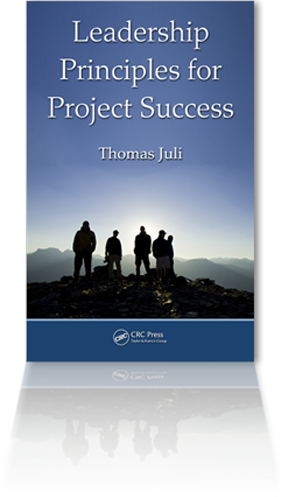 Leadership Principles for Project Success; by Thomas Juli; published by CRC Press; ISBN 978-1-4398-3461-9; 296 pages; Hardcover; © 2011; US$69.95. For more about the book, click here. . A copy of this book will be shipped by the publisher at no charge to 3 lucky winners. Drawing to be held on 11 February 2011. For rules and to register, visit http://www.pmforum.org/PMGiveAways/Free-PM-Books.html. PMForum’s PM GiveAways™ Program is based on periodic DRAWINGS for free educational and professional project management products and services. PM GiveAways™ will include project management courses, books, conference passes, software and other valuable items. Drawings will be held at least monthly, with the products and services to be given away announced in breaking news articles ahead of time and on PM GiveAways™ web pages. To learn more or to register for drawings for free project management stuff, visit http://www.pmforum.org/PMGiveAways/PMGiveAways.html. CRC Press is a premier publisher of scientific and technical work, reaching around the globe to collect essential reference material and the latest advances and make them available to researchers, academics, professionals, and students in a variety of accessible formats. Its mission is to serve the needs of scientists and the community at large by working with capable researchers and professionals from across the world to produce the most accurate and up to date scientific and technical resources. Click to see CRC’s project management titles. PMForum operates www.pmforum.org, the world’s first website devoted to professional project management and still one of the most popular online sources of project management news and information. PMForum also produces the monthly PM World Today eJournal where articles, reports and stories about projects and project management around the world can be found; free subscriptions at www.pmworldtoday.net. A couple of years ago I came across the bestselling book “The Instant Millionaire: A Tale of Wisdom and Wealth” by Mark Fisher. I openly admit that when I first heard about this book the title itself was most appealing. Reading the subtitle, it confirmed my interest. And it was a good buy. No, it was an excellent purchase. This book is not primarily about how you can optimize your financial situation. You can certainly read it from this perspective. But you may miss the most important element, the core of the book. The book is a tale of wisdom and wealth. It is about pursuing your goals in life. And it is about having the right attitude towards yourself, your goals and your environment. Now compare these insights to, say, a project you are about to set up, manage, rescue or re-align. What you need to start is a vision. You need to have a direction or else the project will not take off into the right direction. Spend the necessary time to build this vision – with your team. Share your excitement, talk about the challenges you have identified and how you can master them, be precise in what you want to achieve. And – never lose happiness, i.e., enjoy the process, have fun. This book is excellent from many perspectives. I highly recommend it.